The "B" next to the altitude means the altitude is calculated on Barometric pressure, an R would indicate Radar altitude. "TAC" or "TACT" refers to the main menu type, i-e either "Tactical" or "Support" (SUPT). (TAC) contains options for combat-oriented systems such as radar and stores management, and (SUPT) is used to access non-combat functions such as navigation and maintenance modes. 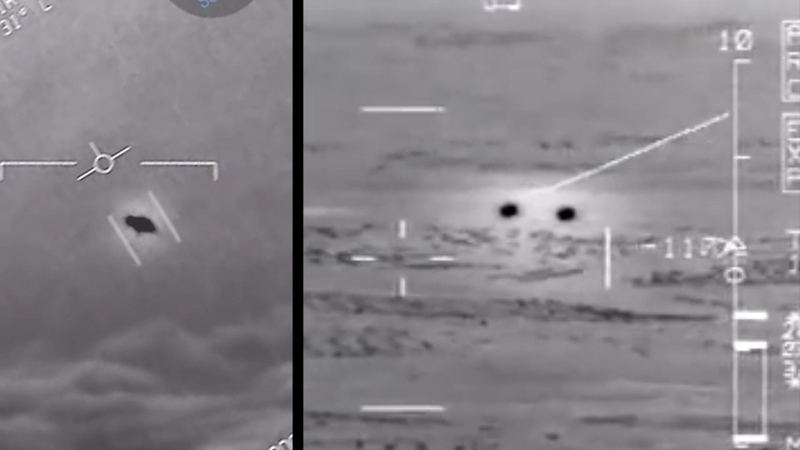 There's a great example of fighter jets on FLIR here, which I compare side-by-side to the Gimbal UFO below. I've also posted that comparison on video here. Suppose we only had the snippet of this fighter-jet footage before the FLIR zooms in enough to see the actual jets. We could then say much of what the proponents of the Gimbal video say about it, that these UFOs have no wings or visible propulsion system and appear to be propelled at high speeds by technology not present in the inventory of any military force. Lol! Then all that "analysis" vanishes in a split second with a quick zoom. So it seems likely we're in that same epistemic hole with the Gimbal footage. However, there's a notable difference with the Gimbal object and any other aircraft-FLIR video comparator I've seen, which is that the Gimbal object has a reasonably consistent (and so coherent) detailed curvilinear outline throughout the clip, curves that are even artistic, or aesthetic, in nature. In contrast, the available (and very limited number of) examples of jets on FLIR resemble blobs with very fuzzy edges. So it's possible that the Gimbal shape closely reflects the actual mechanical design of the object. For that reason I've been pounding away on google for some kind of rigid weather balloon or blimp that could fit the bill. Which raises an important question I don't have data for, which is: How fast is the Gimbal UFO moving? It may in fact not be moving as much as the footage seems to imply. Most importantly, we need to know if such a blimp can rotate as seen, and gets as hot (black) as the Gimbal object. That last point may refute the blimp hypothesis because I suspect a blimp on FLIR would show thermal variance from sunlit side (darker) to its shaded side (lighter), but the Gimbal object looks pretty hot, and uniformly so across its apparent shape. Suppose we only had the snippet of this fighter-jet footage before the FLIR zooms in enough to see the actual jets. We could then say much of what the proponents of the Gimbal video say about it, that these UFOs have no wings or visible propulsion system and appear to be propelled at high speeds by technology not present in the inventory of any military force. Lol! Then all that "analysis" vanishes in a split second with a quick zoom. You can use the vegetation patterns to display both zoom levels are the same scale. So what we are seeing is the IR glare being bigger than the actual plane, and covering up any detail. It might be useful to get a more comprehensive explanation of the display overlay above, as the might be clues. So SLEW here is not active, and the TDC control is done by the rear cockpit. Mick, wow, fantastic analysis! So it seems the thermal shape of a fighter jet on a FLIR screen might entirely overlap its actual form. Also, variable contrast settings on a specific camera or its software might artificially etch out a crisper edge than another FLIR system with different contrast settings. Though it's possible a dead-on rear view isn't even necessary for a strong and stable thermal signature with a similar impression. We should want hundreds of hours of FLIR-jet footage to know the range of possibilities. What puzzles me is the fast motion of clouds that seem to be further than the object, but that could be an illusion. The fast motion of the clouds across the field of view seems to suggest they're not so far away. All that in turn creates an impression (an easily false impression) that perhaps the object is not even more than a mile away. I've seen your distance analysis. The distance to the object is another missing datapoint from the highly-selective release that is allegedly accompanied by "chain of custody documents" but in fact lacks even a scintilla of supplementary documentation. In many ways it's foolhardy to even be guessing on this lacking any supplementary case data, except I guess for those of us who just like tackling a 'What is it?' mystery. What puzzles me is the fast motion of clouds that seem to be further than the object, but that could be an illusion. The fast motion of the clouds across the field of view seems to suggest they're not so far away. All that in turn creates an impression (an easily false impression) that perhaps the object is not even more than a mile away. The easiest way to get some perspective on this is to note that the clouds never get any closer, even when the jet is heading directly for them at 240 kts. Total cloud movement is about 6° to 7°. total camera rotation is 60° (54 to -6). So the camera rotates about 10x the rate the object is moving relative to the clouds, angularly. In the first 300 frames (10 seconds), the heading changes from 54° to 40°, 14 degrees, or 1.4° per second. about 4.28 minutes for a full turn. Air speed is 241 Knots, 277mph, so in 10 seconds the jet would have travelled 0.77 miles. Notice the speed of movement of the pink line, it starts out moving smoothly, but then slows down and essentially stops as the Jet Heading (black arrow) crosses over it. Just like in the video. 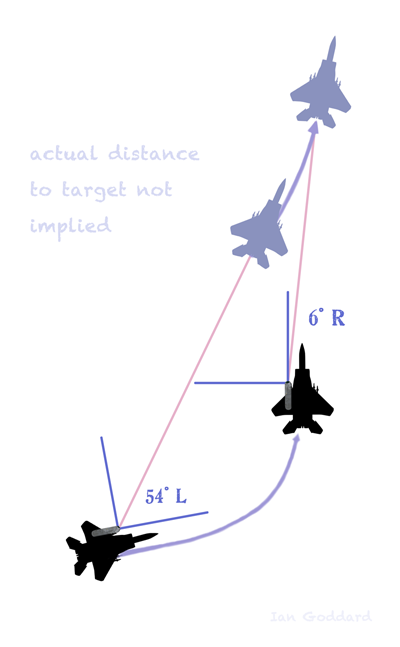 This is making some gross simplifications about the turn rate and path of the jet, but I reckon it's in the ballpark. Here's a better animation synced with the video. It's illustrative of the size of the angles involved and the angular motion of the clouds. A simplification of the general movement of the GIMBAL UFO. Here the UFO is NOT moving. The Jet executes a 60° arc turn. The pink line is the line of sight from the jet ot the UFO (marked with distance in miles, staring at 15 miles), the clouds seen in the video are behind the UFO, so as the pink line moves left, the clouds move right. Note the slowdown of the pink line as it approaches the end. The actual paths are likely more complex, but this demonstrates the general idea. Here's a video showing a rotating flare, with large rotation for small camera movements. That overloaded signature seems to rotate clockwise as the aircraft moves further away and rotate counter-clockwise as it approaches the target (using the ELV screen data to determine distance). That effect might be caused by the camera adjusting its focus to changing focal relations. Also important to note, there's no rotation of the camera even as that overloaded target rotates, which is also sometimes true of the Gimbal camera and target. The smooth mechanical rotation of that overloaded target above strikes me as the same smooth mechanical rotation we see in the Gimbal FLIR's overloaded target. So even given differences in the shape of this vs the Gimbal target, having watched the Gimbal footage 10 thousand times, looking at this signature feels like the same kind of motion. Eighty nautical miles off San Diego, the U.S.S. Nimitz Battle Group was engaged in routine training. Then it became anything but routine. Three F/A-18 Super Hornet fighter jets practicing dogfight maneuvers were interrupted and revectored mid-mission to investigate an Unidentified Aerial Phenomenon; military parlance for a UFO. They engaged the craft, but were quickly outmaneuvered and lost visual contact. It had simply vanished. The pilots were clearly baffled by the object. “Look at that thing, dude,” said one in a video credited to the U.S. Department of Defense by the New York Times. Fast forward 13 years to Dec. 16, when the New York Times published a report on the 2004 incident and a little-known Pentagon program that tracked such reports from 2007 until at least 2012. Included was the video of the incident, which was captured by a Raytheon Advanced Targeting Forward Look Infrared sensor, mounted under one of the fighter jets. 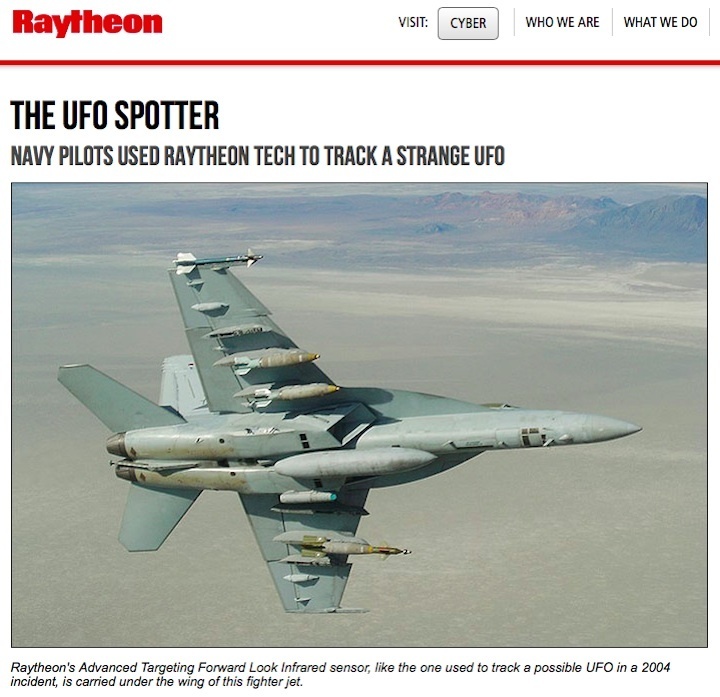 Called the Advanced Aviation Threat Identification Program, the government program analyzed UAP imagery and data such as the images from the Raytheon-made ATFLIR. A U.S. Navy ATFLIR, designated AN/ASQ-228, mounted under a fighter jet. ATFLIR, designated AN/ASQ-228 by the U.S. Navy, is a single pod that combines mid-wave infrared targeting and navigation FLIRs, an electro-optical, or visual light, sensor, a laser rangefinder and target designator, and a laser spot-tracker. It can locate and designate targets day or night at ranges exceeding 40 nautical miles and altitudes surpassing 50,000 feet. Even so, the video images are not definitive proof that the jet pilots were chasing an actual UFO. So how best to track an alien spaceship in our skies?